The Grinnall Scorpion 3 was first manufactured in 1992 by Grinnall Specialist Cars, Worcestershire. (UK.) Grinnall were already long established for their refined conversions of vehicles including the Triumph TR7 and a Grinnall TR 8 4-wheeler. 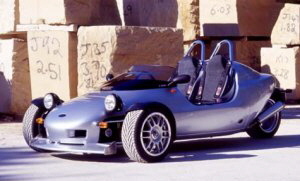 In 1991 Mark Grinnall set about creating a 3-wheeler which was introduced in 1992 as the Scorpion 3. The body of the Scorpion 3 was designed by Steve Harper whilst Mark Grinnall and Neil Williams designed and developed the chassis and mechanics; these were then refined and tested in collaboration with leading engineering analysts, Mecal of Hollan. The car is a two seater sports 3-wheeler that is powered by a range of engines from BMW Motorcycles from the K100 1000cc 8v engine up to the K1200 1200cc 16v engine giving an average top speed of 130mph. The body of the Scorpion 3 is made of Kevlar reinforced fibreglass construction that is mounted onto a steel tube space frame that has an Epoxy powder coating and houses two orthopaedically designed seats that feature fire resistant upholstery. Other features of the Scorpion 3 includes brakes from a Cosworth Sierra and BMW K1 suspension. Grinnall also manufacture a 3-wheeled BMW based Trike and a 4-wheeled Grinnall Scorpion IV with a 5 cylinder 2.0 litre Fiat engine was introduced in October 2000.